Background: Sickle Hemoglobin is the most common pathological hemoglobin mutation worldwide which forms sickle shape or elongated forms on deoxygenation. According to malaria hypothesis, there is resistance against malaria by the heterozygous carrier state. There is spread of Hb S allele from the highly malarial regions to most other regions worldwide. The study was conducted as Sickle Hemoglobin has been frequently seen in our institute. 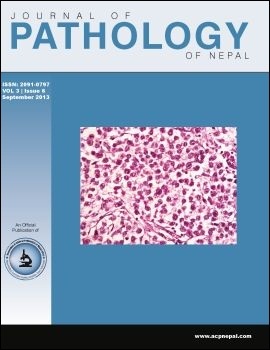 Materials and Methods: This study was conducted in the department of pathology, Maharajgunj medical campus, Tribhuwan University Teaching hospital, from January 2011 to January 2013. All the relevant data were obtained from the archives of the department. Hemoglobin electrophoresis was performed by Cellulose Acetate Electrophoresis at alkaline pH Method. Sickling test was done using sodium dithionite. Results: A total of 35 cases were diagnosed as sickle cell disorder. The male: female ratio was 2.5:1with the commonest age group 11-20 years (42.8%). Sixty percent showed hemoglobin between 6-8 gm/ dl. Tharu, Chaudhary and Tharu, Rana (91.3%) were the commonest ethnic group with both sickle cell anemia and trait. Lama, Neupane and Baral suffered only from trait. Mean corpuscular volume ranged from 82 to 94 fL. On peripheral blood smear reversible and irreversible sickle cells were present in 88.56 % of cases and 11.42% were devoid of sickle cells. Sickling test was positive in all cases. On cellulose acetate electrophoresis 22 (62.85%) cases had Hb S, Hb F and Hb A2 or HbS and Hb A2 where as 13(37.1%) showed Hb S, Hb A and Hb A2 variants. Conclusion: The commonest ethnic group of Tharus(91.3%), Chaudhary and Rana are from Terai region of Nepal which is a malarial zone. However 8.4% of cases were seen in other ethnic group who are from non-endemic region.